Dan has spent the last two weekends away from home. Two weeks ago it was the Stafford Uni reunion, something he has attended each year since we moved away from the area back in 2010. Then last week, it was the stag of one of his best friends. I spent most of the first weekend incredibly bored and lonely, despite having a million things to do. 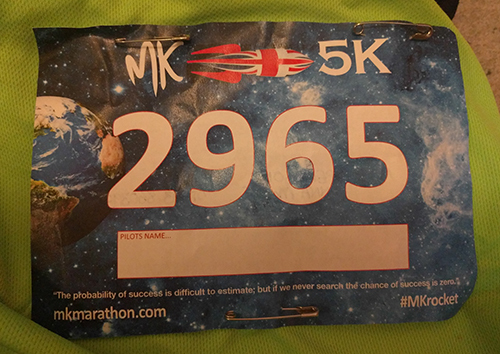 Luckily though, for the bank holiday weekend I had already booked up to run the Milton Keynes 5k on the Sunday morning, followed by the half marathon on the Monday. 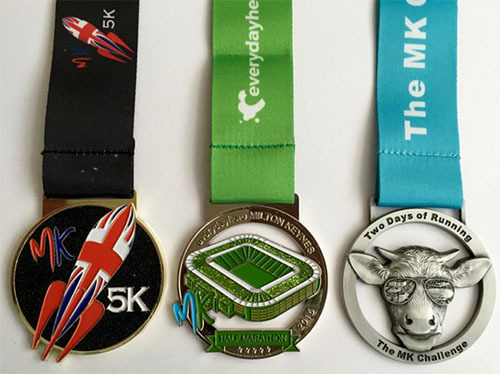 The medal on the left is for running the 5k on the Sunday, the medal in the middle is for the half marathon on the Monday and the cow medal on the right is for people that ran both of the events! We didn’t have huge numbers from our club heading over for the 5k, but having introduced me to the beautiful medals originally, Laura was heading over for the race, along with Pete, a runner from her office. Because the race was point to point, and Laura and I were running the half marathon the following day, Pete the full, we decided not to walk back to the cars at the start line following the race. Instead, we planned to meet up beforehand at the stadium (finish), leaving my car at the stadium so that following the race we would be able to jump in for instant warmth on the chilly morning, before driving back to pick up Laura’s car which we would drive to the start line. Precision planning. We even each brought two hoodies along – one for each car! 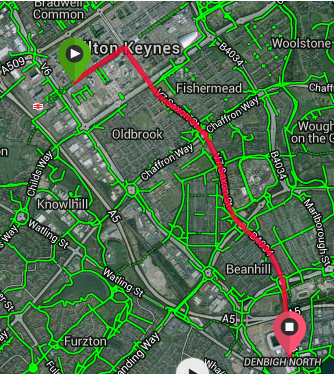 The route to the start line was an almost straight 5k distance away to the local Wetherspoons. Only interrupted by the many, many roundabouts and turn-off just before reaching the pub. To be fair, the conditions were raceday perfect. The weather was chilly enough to wear a t-shirt underneath my club vest, but to still feel comfortable in shorts. My ideal raceday outfit! We had arrived fairly early, but there was still a large queue for the toilets. Luckily we had anticipated this so headed over quite early before returning to the warmth of the car to fill out the emergency details on our race numbers, which were also pretty awesome! Laura and Pete came up with witty ‘Pilot names’ but it was too early in the morning for me to feel inspired! The race started on time, although we weren’t aware of the actual start happening, just of people moving gradually forward towards the start line. Laura and I had agreed beforehand that we would run our own races. I wanted to see what my 18 week pregnant body was capable of running a 5k in and Laura was hoping for a post-injury PB. The first road up until the turn was rather congested, and I found myself battling to pass several people. Used to running 5ks at Northampton racecourse for the parkrun, I tend to be able to work out where to place myself, now being familiar with many of the runners who turn up week after week. Travelling that little bit further over to Milton Keynes, I barely recognised anybody. Although not a narrow road, the road was much narrower than when we turned and I found myself having to keep jumping up onto the pavement to be able to stretch my legs in the way they wanted to run. Having been sold as a ‘downhill race’, the first section was very definitely uphill as well! After the turn the road became wider, the field of runners spread out and I was able to settle into my stride a little better. I’ve mentioned it before on the blog but when the baby is lying in a certain position it is rather uncomfortable to run and this was the case last Sunday morning. Not painful, just, it makes me very aware that I am carrying a baby! After about a mile and a half it must have moved though, because I felt much more relaxed and comfortable again. The first mile went by in 9:13. I had worried initially after seeing Laura shoot off at the start. I wanted to think I was still capable of a fairly comfortable sub 30min 5k time, something Laura hadn’t yet achieved since her injury, but she soon disappeared into the distance. I guessed she must have been feeling good though, and I could only run what I could run comfortably. I had no intention of pushing things at his stage. The second mile went by in 9:36, having slowed slightly at the beginning so I could prod my belly to try and make the baby move into a more comfortable position! It was at the end of this mile that I realised Laura was now just in front of me, and I slowly closed the gap until I went past her. She said she had gone out too quickly and was now just holding on. Mile three and things were fully comfortable again by now so I was able to pick the pace back up again, passing lots of runners and finishing the mile in 9:14. I still had a fair amount of energy and so decided to pick the pace up for a sprint finish to the finish line upon reaching the car park. As I turned in off from the main road I let my legs extend further and increased turnover to run the final 0.15m at 7:57mm pace. Literally as I crossed the finish line I realised that my car keys were hidden on the floor of Laura’s car…all the way back at the start! Oops! Best laid plans and all that! Laura finished less than a minute behind me, giving her her first sub 30min 5k since injury last year. Pete also PBd, so at least everyone was in a fairly good mood when I told them that I had carefully tucked my keys under one of Laura’s shoes in her car so that no passers-by would be able to see them! We hunted around for other runners from our club to see if we could beg a lift, but after cheering us over the line, they had all headed home and the runners from Pete’s club all intended on running back to their cars left at the start, some of them, whilst carrying winning trophies! In the end, we bravely stepped towards members of another local club and they took pity on us, taking Laura with them to go collect her car, and my keys! Have you ever had race logistics problems?! Ever lost/forgot your keys whilst out on a run? This event wasn’t unusual for me! Well done! I think the only 5k races I have ever done have been race for life, and one local 5 k which wasn’t chip timed or anything. 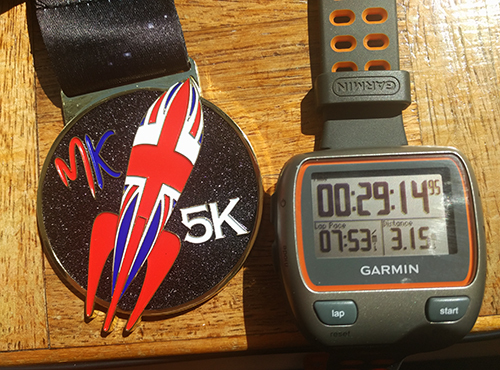 I did a poppy run and I think that might have been 5K? But again not chip timed! Like you say parkruns are good for that sort of thing. Losing my key is one of the biggest nightmares. I always check and double check my pocket as I always worry about it falling out. At least you got it sorted in the end! It’s just so easy to slot in a parkrun each week to get that 5k hit! PS Such cool medals! One of my friends did both too- I love the idea of the extra medal for 2 races- the rock and roll series do that too, and I think Disney does. Getting the Disney medals is on my bucket list! I didn’t realise the Rock & Roll races did the extra medal too. I shall have to look out for next year. Those medals are very cool! Nice job on getting a sub-30. Sadly, I regularly wander around our house saying “if you were [any object, but especially keys], where would you be?”. I have only lost my keys outside of the house once or twice, and it’s been so traumatic an experience that I am usually quite good now. Indoors though, that’s a different story! Those medals are cool! Nice you get a third one. I found it really odd that you can poke the baby back into position! I guess it makes sense but it made me wince a bit…clearly I have no clue about pregnancies or babies!! Anna @AnnaTheApple recently posted…The best meal of my life? Yup, it seems to work. I kind of massage-push and it will move sometimes. It’s a little weird, but if it works, I’m doing it! Apparently running is supposed to be quite soothing and helps to make it fall asleep, so that’s handy…as long as it’s in the correct position to start with! I am not good at this early morning running malarkey! That medals are so great! The third one is awesome, i love it :D. Great results, keep training, you are great! The clock is really great and the medals I love. The result is really inspirational. By the way, keep up the great work. Now, I am going to share this post on my Facebook post to see my friends. Thank you so much and keep posting things like this.